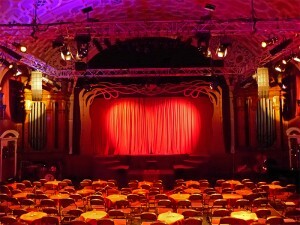 Orbital Sound reports that it has supplied a multi-purpose sound system for London's Battersea Arts Centre, based on the T-Series loudspeakers from d&b audiotechnik. Housed in an architecturally renowned 19th century listed building, formerly Battersea Town Hall, the venue has a vast complement of performance spaces, offering audience capacities ranging from 10 to 500, and is regarded as one of the UK's most influential theatres. The new system’s capabilities were recently tested to the full by Little Bulb Theatre’s Orpheus, which featured a demanding live score ranging from hot club jazz to grand opera, including a ground-shaking baroque organ. The new system is designed for semi-permanent installation in the venue's main room, as well as allowing flexible deployment in other spaces, and comprises a central hang of seven d&b audiotechnik T-10 enclosures, plus two ground-stacked d&b E15X-SUBs, per side. Key selection criteria included configuration flexibility and scalability, as well as exceptional sound quality. The venue's brief called for a system with the smallest practical complement of loudspeakers necessary to achieve excellent quality of sound in the Grand Hall, its largest room, with a 500+ capacity. An additional requirement was the ability to re-deploy some of the loudspeakers in other performance spaces in the 70-room complex, while leaving a thoroughly workable system in the Grand Hall for smaller events and spoken-word reinforcement. The installation forms part of a restoration and refurbishment programme, which includes improvements to the venue's technical infrastructure, as well as work on key architectural features such as its octagonal glass dome. 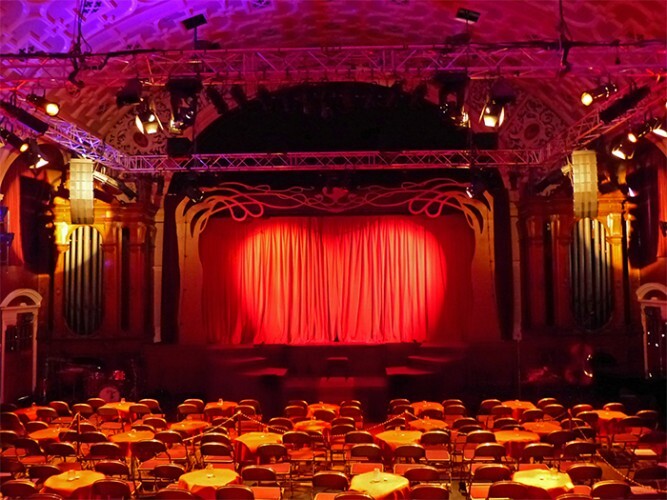 Philip Bentley, technical manager at Battersea Arts Centre, explained: "We researched various options before making our decision, but it was the sheer flexibility and scalability of the T-Series that won the day, in addition to its sound quality. Overall, going the d&b route with the T-10 system gave us more control than with the other systems we compared - the design's inherent line-array and point-source options simply offered us a lot more for our money. "We can use the new loudspeakers in an array format, or divide them up into smaller point-source systems, enabling us to cover simultaneous events in a number of rooms. For example, we had to set up the Council Chamber in a 150-seat cinema configuration recently, and were able to use five of the T-10s per side in L&R hangs, with two of the subs. This left the remaining units as a point-source system in the Grand Hall, ready for other events. This degree of deployment flexibility is key to our longer-term planning, as it gives us the facility to expand our complement of T-Series in affordable stages, safe in the knowledge that the system components are inter-compatible, and can therefore be used around our building in multiple permutations and combinations. "The products are small and relatively lightweight, and are therefore easy to rig, while being unobtrusive in our smaller rooms – an important point given the historic nature of our site and its architecture. We strive to make our venue as welcoming an environment as possible, and that ethos is now reflected in our technical equipment as much as in the building itself." Sound designer Ed Clarke was responsible for the design of Little Bulb Theatre’s Orpheus, employing every aspect of the new system to achieve the critically acclaimed results. He commented: "Orpheus was a deceptively complex piece of theatre – a seven-piece band, eight actors using radios, and with the style varying between 1930s Paris Cabaret, grand opera and French romantic classical. And the baroque organ! It was always going to be particularly tricky in the Grand Hall, as the company were using so much of the space - not simply the stage, but also coming down some considerable distance into the auditorium. I needed a system that would cope with gentle, unobtrusive vocal reinforcement, as well as really quite loud amplification of the organ. The d&b T10 system was just perfect for this kind of project – in terms of its audio competence, and in terms of its simplicity and size from the rigging point of view. Either as point-source or arrayed – we used all 14 boxes that Orbital supplied in two arrays for Orpheus – the real star feature of the T10 is its controllability. In a big space like the Grand Hall you need a system that's going to do what you expect it to do right out of the box. It has a transparency that allows reinforcement, as opposed to amplification, to work particularly well. The show received a number of notices commenting on the 'earth-shaking' sound of the organ – we kept it quiet that the sound was mostly invented behind the sound desk, and that the earth-shaking result was largely due to those 4 EX-15s!" Orbital Sound's system design for Battersea Arts Centre included the necessary mounting and rigging hardware to cover the various re-deployment scenarios, with typically three of the d&b T-10 units being used per side on a cluster bracket, pole-mounted from a E15X-SUB. Three d&b audiotechnik D6 amplifiers were also supplied, with each channel capable of driving up to four T-10 loudspeakers, further contributing to the system's flexibility. 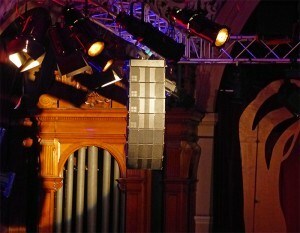 In picture: Orbital system in Grand Hall Battersea Arts Centre and a close-up of the speaker-hang.